The next Catalyst Poetry Open Mic has a special guest feature poet, none other than David Eggleton. David has been making a habit of visiting the Garden City of late with appearances at The Press Christchurch Writers Festival in 'Poetry for Lunch' (he was also one of our guest judges for Survivor: Poetry) and a recent guest turn at the Canterbury Poets Collective Spring series of readings. Next week he's our feature poet at the regular Catalyst open mic upstairs at the Pegasus Arms (Vespa Room). Be there! 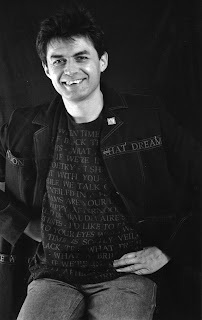 If you have yourself a copy of our latest issue - Catalyst volume 9 Export Quality - you will have heard David's distinctive delivery as he performs his poem 'Taranaki Bitter'. Certainly one of NZ's foremost performance poets and writers - I've seen the word 'mesmeric' used in more than one online reference - here's a taste to get you going! David Eggleton is a poet and writer whose articles, reviews and essays and short stories have appeared in a wide variety of publications. He has had published six books of poems and a book of short fiction, and has written or contributed to many works of non-fiction. He has also released a number of poetry recordings featuring his collaborations with musicians. He has also released a number of poetry recordings featuring his collaborations with musicians, and been involved in poetry text collaborations with practitioners of a variety of other art forms, from sculpture to film to fashion design. His first collection of poems was co-winner of the PEN New Zealand Best First Book of Poems Award in 1987. He has performed his poetry widely, both in New Zealand and overseas. His most recent book of poems is Time of the Icebergs, published by Otago University Press in 2010. His most recent book of non-fiction, published in 2007 by Raupo Publishing, is Towards Aotearoa: A Short History of Twentieth Century New Zealand Art. He currently edits Landfall and Landfall Review Online, and is the Ursula Bethell Writer-in-Residence at the University of Canterbury for the second part of 2012.